The Health Spa & Gym, a sanctuary for relaxation, personal rejuvenation and serious pampering flows onto a full size pool, fringed with palms and a waterfall. 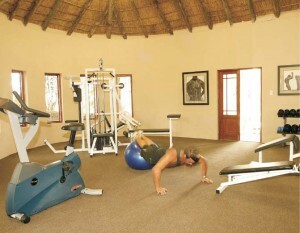 We pride ourselves on our uncompromising approach to wellness. Our dedicated and professional therapists are on hand to make the spa experience as memorable as possible. The latest techniques of the modern world are meticulously combined with age-old remedies to create an unforgettable African touch, in an exceptional environment where relaxation comes easily. Enjoy the healing benefits of water in our various hydro therapies. Allow the underwater jets of the hydro bath to invigorate your muscles. Choose from a variety of milks or essential oils to suit your mood and to enhance your hydro experience. The sauna and steam room will aid in stimulating circulation and preparing the body for massage. Our indoor wet area features the stunning Vichy and Chromotherapy showers. Relax on a heated marble slab, while the gentle buffing of a Geranium and Pine body polish, smoothes you skins’ surface, and varying pressure in the warm water washes it clean away.